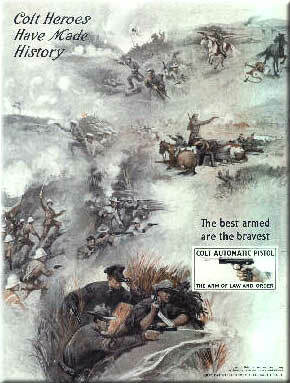 The Connecticut State Library is also a good source for historical information pertaining to Colt firearms and history. Their phone number is (860) 566-3692. Colt's Manufacturing Company, Inc. - See address above. U.S. General Officer Pistols - a quick link to an index of pages on Coltautos.com dedicated to picturing and describing pistols issued to US General Officers along with history about the officers to whom they were issued. Office of Strategic Service Society - with links to declassified list of personnel. United States Army Military History Institute - The U.S. Army Military History Institute ( USAMHI) is an institute of the U.S. Army Heritage and Education Center. Their mission is to preserve the Army’s history and ensure access to historical research materials. They serve as the primary facility where researchers study Army history. 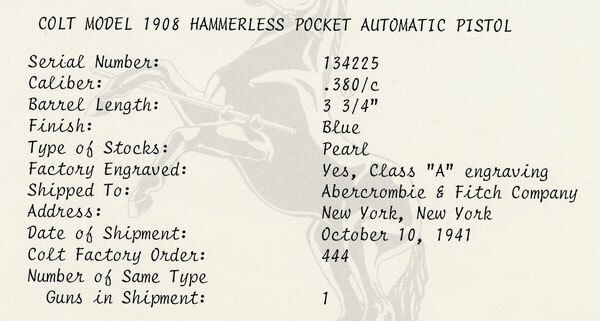 USAMHI holdings include books, manuscripts, photos, and maps. Both official and unofficial (or public) patrons are welcome . They give highest priority to Army users. There is no fee to enter the Institute. A fee-for-service is charged for providing copies of holdings to unofficial patrons. Arlington National Cemetery - A privately maintained site that contains many of the names of those buried there along with their military histories. This is an excellent source of information when researching a Colt firearm that has been identified with a particular soldier. Military Times Hall of Valor - The HALL OF VALOR now contains 97,731 valor award citations of heroes from the U.S. armed services. Naval Historical Center - This is an official U.S. Navy web site. Their mission is to enhance the Navy's effectiveness by preserving, analyzing and interpreting its hard-earned experience and history for the Navy and the American people. Online Military Indexes & Records - A Genealogy Guide. This website is a directory of links to online military indexes and records for USA genealogy research. Included are rosters, databases of soldiers, and listings of military and war casualties. Also included are some links to sources for military records in other countries (for World War I & II). Nationwide Gravesite Locator - Search for burial locations of veterans and their dependents in VA National Cemeteries, state veterans cemeteries and various other Department of Interior and military cemeteries. Springfield Armory (1777 - 1968) - 1 Armory Square, Springfield, MA 01105-1299, (413)734-8551 From 1794 to 1968 the Springfield Armory was a center for the manufacture of U.S. Military small arms and the site of many important technological advances. A large weapons museum is now housed in the original Main Arsenal Building. Air Force Link - This data base holds biographical information on Air Force leaders -- active duty or retired (since March 1995) general officers, senior civilians and all chief master sergeants of the Air Force. The Generals of World War II - A utopian project trying to provide biographical data on the army generals of World War II of all participating countries. So on these pages you will find information on many thousands army generals. Taking into account the scope of the project the information on each general will vary in detail. U.S. Army Military History Institute Photo Database - This database is a catalog of American Civil War (ACW) photographs from the Special Collections Branch of MHI. Usually, patrons are searching for ancestors, researching particular ACW regiments, or looking for examples of items worn or used by soldiers of the period. Ultimately, this database will reflect the full range of MHI's photographic collection, ranging from the periods of the Mexican War in the 1840s to recent operations such as those in Somalia and Bosnia. As our digitization efforts expand, we hope to provide links to scanned images through this database. USMA Howitzer Yearbook Digital Collection - Scanned copies of yearbooks, most years available. Submarine Force Museum - The Submarine Force Museum, located on the Thames River in Groton, Connecticut, maintains the world's finest collection of submarine artifacts. It is the only submarine museum operated by the United States Navy, and as such is the primary repository for artifacts, documents and photographs relating to U.S. Submarine Force history. The museum traces the development of the "Silent Service" from David Bushnell's Turtle, used in the Revolutionary War, to the Ohio and Virginia class submarines. Civil War Soldiers and Sailors System - a computerized database containing very basic facts about over 230,000 servicemen who served on both sides during the Civil War; a list of regiments in both the Union and Confederate Armies; identifications and descriptions of 384 significant battles of the war; references that identify the sources of the information in the database; and suggestions for where to find additional information.